Yet "white trash" could be called the Swiss army knife of insults. It's deft in its ability to demean multiple groups at once: white people and people of color, poor people and people who "act" like poor people, rural folks and religious folks, and anyone without a college degree. 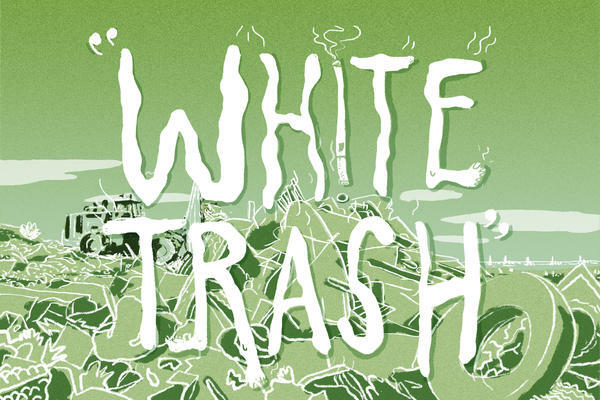 So why does "white trash" still get thrown around without much pushback? When poor (or formerly poor) white folks do get portrayed in the media and pop culture, they're often reduced to a series of offensive stereotypes: that they're angry, lazy, dirty, overweight, sunburned, stupid, racist, alcoholic, abusive, jobless, tacky, diseased, violent, backwards, Bible-thumping and uneducated. Those stereotypes get reinforced over and over again on TV and in movies, as anyone who watched Here Comes Honey Boo Boo or Duck Dynasty will tell you. Like other slurs, there has been some reclamation of "white trash" — songs and cookbooks and T-shirts that celebrate white-trash culture. And plenty of people unabashedly refer to themselves as white trash. But no matter who uses it, the phrase itself reinforces some pretty insidious ideas about the meaning of whiteness (and, by reflection, blackness — we'll get to that in a minute). By accepting the idea that white trash exists, people are tacitly accepting that there is another, different kind of whiteness. Normal white people — the ones who aren't white trash — embody all the things white trash can't: They're hardworking, educated, classy, kind and good. Anyone who doesn't conform to those values can't ever really be fully white. Hence, white trash. Matt Wray, a sociology professor at Temple University, says that if you think about the words white and trash, "you realize that they have nearly opposite meanings. 'White' suggesting purity, cleanliness, even the sacred. While 'trash' is about impurity, dirtiness and the profane." In his book, Not Quite White: White Trash and the Boundaries of Whiteness, he talks about the feelings that contradiction can evoke. "White trash names a people whose very existence seems to threaten the symbolic and social order," Wray writes. "As such, the term can evoke strong emotions of contempt, anger, and disgust." Nancy Isenberg, the author of White Trash: The 400-Year Untold History of Class in America, says that tension between normal and pathological whiteness played out during the 2016 presidential campaign. When Donald Trump was criticized for making racist and sexist comments, Isenberg says the media tried to portray his supporters as "white trash," as opposed to ordinary, upstanding white people. "The problem with the white trash reference is often ... it becomes an easy way to dismiss a group and to generalize," Isenberg says. Even though exit polls have shown that white people of all class and education backgrounds voted for Trump in the general election, Isenberg says it's the people pegged as poor and working-class whites — wearing red Bubba hats and cheering at rallies — who get burdened with negative associations. She says we talk about those white folks as "a group that doesn't deserve to be heard from, either because we don't like them because they're poor and they're violent, or we want to claim that they're the most racist group in society." That last idea — that poor white people are more racist than wealthy or middle-class white people — is an enduring one. Matt Wray says that one of the earliest recorded usages of the phrase "white trash" was in 1833, when the daughter of one of the largest slave owners in Maryland said that there were no tensions between black slaves and white slave owners, only between black slaves and "white trash." "And that has always been part of this phrase," Wray says. "Whites who use the term are saying, 'Look, I'm not racist. The person down the road is racist. The one who drops the N-word, or has the Confederate flag flapping off the back of their truck. That's real racism.' "
Poor white people aren't the only ones who bear the brunt of the term. Of course, the phrase is also a backhanded way of demeaning people of color. After all, "white" is the only racial group that needs a modifier for it to become a slur. There's no "black trash" or "Hispanic trash" or "Native American trash," presumably, because for most of American history, those people were assumed by those in power to be poor, uneducated and criminal. White trash, as described by Wray, is an oxymoron. Black trash, by that thinking, is almost redundant. He says that white trash "is a term that really has white supremacy baked into it, because it's kind of like it's understood that if you're not white, you're trash." And that link between white trash people and normal everyday people of color is nothing new. During the slave era, "white trash people" were sometimes talked about as the white equivalent to black slaves. In 1853, in A Key to Uncle Tom's Cabin, Harriet Beecher Stowe wrote about "white trash people," whom she described as "a class of white people who are, by universal admission, more heathenish, degraded, and miserable" than slaves; "a poor white population as degraded and brutal as ever existed in any of the most crowded districts of Europe." For black people at that time, a life of misery and degradation was considered unremarkable. For white people, it was an abomination. Nancy Isenberg says that connection between black enslaved populations and poor white people was more than just coincidence. She says that when England first started to colonize the Americas, they needed a large labor force to get things going. That workforce came in the form of indentured servitude — thousands of poor British children — a process that Isenberg says laid the foundation for slavery. "[America was] founded as a way for the English to expand their colonial hold, which required people, bodies, a labor system, to be exploited," Isenberg says. "And this is where the term 'white trash' comes from. They literally felt that they were dumping what they called the 'waste people' in the New World. These were people who were seen as unproductive and idle, wandering vagrants back in the Old World. They were going to unload them on the New World." So much has changed since the first European indentured servants were sent to the United States. But from the sounds of it, the way we talk about poor white people hasn't changed much at all. For more in the Code Switch Word Watch series, listen to the latest episode of the podcast or check out our blog.